Randy Graff - Call on Dolly! Randy would meet Jerry at the Warrick Hotel in New York, and he taught her all the songs. She put them all on a tape recorder and still has him singing Time Heals Everything, Wherever He Ain’t, and songs from Dolly. Randy remembers loving the score of Dolly. She was familiar with Before the Parade Passes By and obviously Hello, Dolly! To Randy, It Only Takes a Moment is probably one of the most beautiful ballads ever written. Getting to know Jerry personally, Randy fell in love with him. 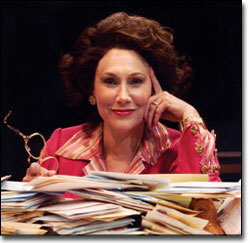 When Randy read The Matchmaker, she really fell in love with the character of Dolly. 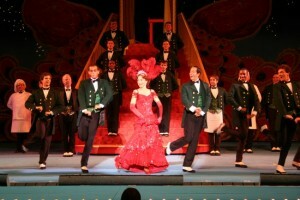 When Randy was given the script for Hello, Dolly!, she saw there were direct passages from The Matchmaker, especially Dolly’s speeches to Ephraim are lifted directly from the play. It is a wonderful play/musical for an actor. It really gives you something to bite into. Other than this great score, you are saying these great words. She wishes that she had had more time with Dolly. She did it in 2007. 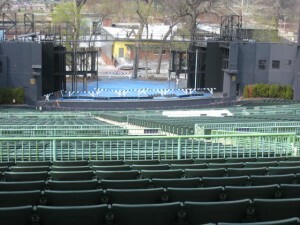 With 11350 seats, the Muny is America’s largest theatre. (See my chapter on Lee Roy Reams.) It is a very different experience when you are doing it on a stage of that magnitude and audience size. There were nights when it rained. Randy would also love to do the play. Randy said they were lucky to have Lee Roy. Doing Summer stock, you have ten days to get it together. It helps to have someone at the helm who knows what they are doing. He knows the show like the back of his hand, and not only was he great at staging it, but he was also able to offer great insight into the character and the scene work. He was extremely helpful to Randy in the eating scene leading into the courtroom scene. Randy admits that they type of “vaudevillian shtick” is not her forte. It was specifically and particularly designed for Carol Channing’s talents. Carol Channing is a clown. She told Lee Roy she wanted to get through this as quickly as possible. She asked for the bits that work and are guaranteed to get laughs and she would do them and that’s what he did. It ended up being a delightful experience because of the people involved. Lee Roy Reams had a lot to do with that. It was a challenge getting a show of this magnitude up in ten days. There was no question that she was in complete control as Dolly Levi. Originally, it was supposed to be Faith Prince as Dolly. The MUNY lost Faith but their faith was restored when they called Randy and she said yes. Paul Blake had been wanting to work with Randy. 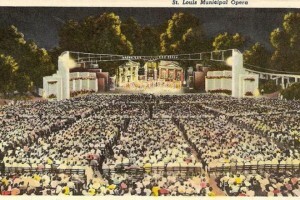 Paul Blake has served as Executive Producer of the St. Louis Muny since 1990. James Clow, a dear friend of Randy’s,was playing Cornelius Hackl This was less than a month after his turn on the Muny stage in Oklahoma! One review said he was ten times better. “For as good as he was as Curly, the part of Cornelius Hackl flatters his comic abilities far more, revealing an intricate comic ingenuity. His partner in crime is Telly Leung as Barnaby, a puppy-dog of an actor who apparently swallowed a lightening bolt during one of the afternoon storms before opening night.” (source: Talkin’ Broadway: St. Louis by Richard Green). 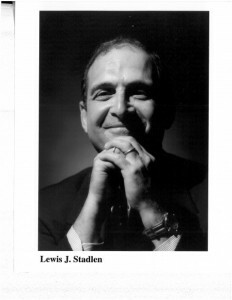 Randy was matched against Lewis J. Stadlen, another dear friend of hers), the growling, gargling, grandiloquent comic who had also appeared in St. Louis as Max Bialystock at the Fox Theater. Randy and Lewis have a history together having done several shows previously. They have a great chemistry. His Horace Vandergelder withstands each one of Dolly’s assaults upon his reason with equally powerful counter attacks, right up until the final moment. 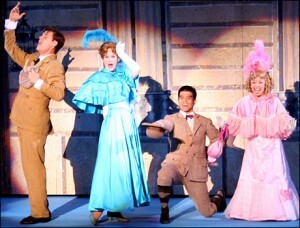 Kate Baldwin, who I also saw in Tovah’s production of Dolly, played Irene Molloy. Add to all of that, the tremendous Lee Roy as director. Randy would love to revisit Dolly, but in a theater, please, rather than a football stadium, which is what it feels like at the Muny. She tried to make those speeches to Ephraim as intimate as she could. It is difficult for Randy to discuss Dolly separate from the conditions she was under. She will say this: It is the first BIG, juicy Lead she has done in a musical, where you get number after number, and the big curtain call moment. Jerry Herman has written so many wonderful roles for women in the theatre, thankfully, this is one of them. Randy has played some wonderful roles in her career, but nothing like this. There is also mounds of responsibility that goes with this undertaking. Lee Roy has been at this a long time and had wonderful stories of past experiences and productions. Lee Roy is one of the best storytellers around. She remembers Jerry as a wonderful spirit and incredibly kind. His love of the show is contagious. Neither the name Gallagher or Levi had any bearing on how Randy played the role. She decided to give her a special dialect. A friend of hers compared it to Ruth Gordon. Her sound made it seem as if she were a woman of the streets instead of highly educated. She did not approach her as an Irish immigrant. It was more of a lower East side New Yorker. In the theater, it is traditionally considered good luck if it is raining on your opening night…UNLESS you are doing outdoor theater. It did rain on Randy’s opening night! She was waiting in the wings to go on for her opening number and the bottom of her skirt was all wet. She did not try and make her as a “star” character or personality, but rather, more three dimensional. She approached it as she would approach any part as an actress. Randy made Dolly a regular gal. Randy is always in process and continued to tweak Dolly after opening. Things are always changing. She felt that after they opened that she was still in rehearsal because they had such a short rehearsal period. Randy just finished playing the lead in As Bees in Honey Drown at the Cape May Playhouse. It is another huge role and, again ten days, to prepare. Randy’s favorite memory of the show is Dolly’s speech to Ephraim (“Epraim, Let me go”). Randy remembers standing on that stage under a million stars and the audience being ever so quiet, even in that arena. It was quite beautiful doing it under the stars. It is such a romantic speech and Dolly is such a romantic. She was pretty terrified of that staircase. Lee Roy says it was ten times bigger than the Gone With The Windstaircase. Her “boys” took such good care of herIt was “Dolly’s” first time back to the MUNY since 1983 and, like Dolly Levi’s trip down the staircase of the Harmonia Gardens herself, it was a triumphal return. Randy remembered looking into their faces individually as she made her descent down the stairs and having a special moment with each of them. She tried to personalize that for her. Dolly/Randy had a specific relationship with each guy. That was very important to her. 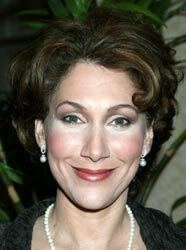 Randy has never seen any other actress play Dolly beyond excerpts on television..and the movie. She has never seen a full production. Those excerpts are of Carol Channing and Pearl Bailey, both of which she loved. Randy is a huge fan of Marilyn Maye and wishes she had seen her. Thanks to Randy Slovacek, who has appeared in various productions including the 1995 Broadway revival under Lee Roy’s direction, the original Champion choreography was used. Lee Roy also works with what your strengths are. Because of the short rehearsal period, Lee Roy gave Randy a lot of freedom in the Dolly number. The Dolly number is virtually foolproof. It is the one number that everyone knows. The Waiter’s Gallop builds and increases the long anticipated entrance of Dolly Levi down those famed stairs. It is brilliantly staged. It is Gower’s genius at work. It is also the song that everyone is waiting for. The biggest change that Randy has seen in this business since starting is that now producers are afraid to use strong actors who are not names or stars. They prefer, because it’s all about economics now, to bring “stars” in. That’s the biggest change but it has been heading in this direction for a very very long time. Producers will do what they need to do to fill those seats. Randy has found that as far as casting is concerned, it has changed a lot as far as that is concerned. Sometimes a role doesn’t fit the celebrity being cast. Look at what is now on Broadway. It is all celebrity driven. Once in a while, a musical like Next to Normal, Once or Wicked comes along that uses strong New York talent. Randy feel that it has changed a lot with respect to casting. Randy calls this the celebrity virus. Randy was involved with the recent Funny Girl production that was cancelled. Randy was going to play Fanny Brice’s mother. The producers were afraid to take a chance on Lauren Ambrose. They didn’t feel that she was enough of a name to carry the lead in a musical. There is a lot of fear now on behalf of the producers. Randy thinks Lauren Ambrose would have been great as Fanny. 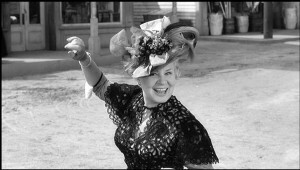 Jennifer Cody is worth mentioning as Minnie Fay. Randy became close as she did with everybody in the cast and it was hard to say goodbye with the final bows of this production were taken. It is bittersweet when it is time to say goodbye. Randy would like to say Hello to Dolly again! Here’s hoping it happens and I will be there to welcome her home!